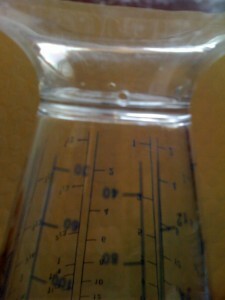 I love my “The Perfect Beaker“, its great for measuring items in the kitchen. I just get annoyed every time I take it out of the dishwasher because the bottom is also a small beaker that collects water as well as other “goodies” while in the dishwasher. 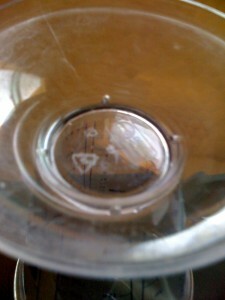 I have to empty the gunk out and re-wash the bottom. Today was the last time. I took it out in the garage and drilled four tiny holes all around the bottom, so any water that ends up in there can drain out. Hopefully the next time I reach into the dishwasher to take out my “The Perfect Beaker” the bottom will be empty and dry.